Almost everything we do in our modern day involves “observing over a long time.” Many of us spend hours at computers, dealing with lighted screens, flashing ads, and that ever-moving cursor. Our modern age, with its televisions, smart phones, artificial lighting, and fast pace give us unique challenges to our vision. I often remind patients that 150 years ago, the only reasons someone would have their eyes darting rapidly from side-to-side would involve danger–someone or something was after you, or you were after it. Today, our eyes constantly track rapidly back and forth–whether we’re watching for traffic while driving or reading an ebook. All that use strains your eyes. But it does more. 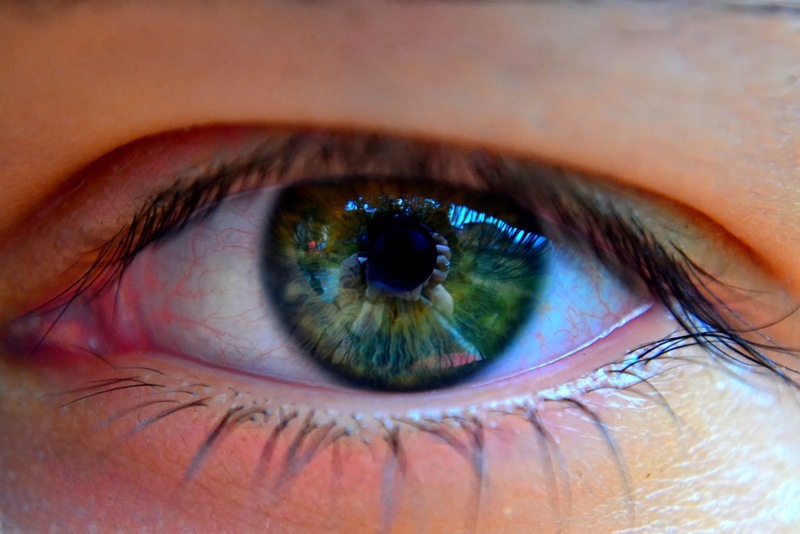 In Chinese medicine, eyes relate to the health and function of the Liver. Wearing them out stresses this organ system. Your “Liver energy” also manages your body’s response to stress, it’s ability to do things smoothly and on time (whether that’s getting sleepy at the right time or digesting food without incident), and has a lot to do with pain. The Liver governs the movement of qi. Qi getting stuck causes pain. (See this article for an explanation of stuck qi, and how to fix it) The Liver and Gallbladder meridians, which work together, affect the head, eyes, inside and outside of the legs, and influence the workings of every other system. Keeping them happy is a big deal. Here are a few ways to help your vision, and your Liver and Gall systems working well. Give your eyes a regular break. If you read or work out on the computer a lot, take regular breaks–at least every 90 minutes. Whenever possible, find a quiet place and close your eyes. Gently rub around your eyebrows and under your eyes. Give yourself time when you don’t have to “observe frequently.” Allow your eyes to unfocus and take a few moments off in a quiet place a few times a day. Get enough rest. Lack of sleep is so common as to be endemic in modern society. Now we know what Chinese medicine has known all along–sleep is absolutely necessary to process stress. One of your Liver-Gall Bladder’s jobs is to file away the stress of the day while you dream–and it is at its most active between 11pm and 3am. Many creative people use these hours because they have a burst of energy. But they sacrifice their “unconscious sorting” time when they do so. Get the rest you need, and especially get your rest during these hours–you’ll find you have more creativity during the day if you allow it to build and do its job at night. Chrysanthemum morifolium or Chrysanthemum indicum plants) are used in Chinese herbal remedies to strengthen Liver blood and especially to strengthen the eyes. Most Asian markets will have instant beverages called “Chrysanthemum Tea,” which may be heavily sweetened but can be used to help your Liver qi. You can also buy an unsweetened version online (see bottom of page for an affiliate link). Deal with stress. Stress, especially emotional stress, is one of the major obstacles to Liver and Gall Bladder meridian functioning. Dealing with stress as it occurs will allow this organ system to keep up with its job of making thing happen at the right time in your system, and will allow it to properly nourish your eyes. Our modern world is especially hard on Liver energy, and especially hard on eyes. Take steps to prevent wearing out the windows to your soul. You’ll be more creative, less stressed, and better able to build the life you want.